The Viscount John Thurso, MP, grandson of Sir Archibald Sinclair, unveils the new nameplate of 34059 on Friday 24 April 2009 at Horsted Keynes station, prior to the locomotive’s return to traffic after a 30 year restoration. Photo The Bulleid Society. A newly restored ‘Battle of Britain’ class pacific, 34059, was rededicated with the name the engine was given when she was first built in 1947. Sir Archibald Sinclair, Liberal MP for Caithness and Sutherland from 1922 to 1945, was Secretary of State for Air in Sir Winston Churchill’s War Cabinet during World War II, and was present when it was originally named after him at London’s Waterloo Station. Now his grandson, Viscount John Thurso, has rededicated the locomotive named after his grandfather. 34059 was withdrawn from service by the Southern Region of British Railways and bought by Woodham Brothers in 1966. Here it languished for thirteen years, gradually being stripped from ‘useful’ parts, until it was rescued and brought to the Bluebell Railway in 1979. Now after a 30-year restoration it has been completely restored to working order. There is only one word for its present condition – magnificent! The news that PKP Cargo has suspended its steam specials from Chabowka for the 2009 season does not augur well for for the future of the Chabowka – Nowy Sacz line. If you follow the link you can see the pictures of some Cracow cyclists who have already tested out the line as a possible cycle track. The Chabowka railway museum is due to be transferred from PKP Cargo to the custody ofthe Malopolska state governor’s office. Meanwhile there is a tug of war between the Chabowka management and the Wielkopolska division of PKP Cargo who would love to have the working Chabowka engines at Wolsztyn. There are even rumours that Fundacja Era Parowozow would be willing to sell some of the Chabowka engines. Maybe the Chabowka team will be able to ward off these threats? Only time will tell. Bill Parker’s GWR 5521 at last year’s Wolsztyn Steam Gala. This year’s Gala will be the last public appearance of the engine in Poland before she returns to the UK. The following changes have been made to the programme that we published earlier. Due to the risks of fires in Germany, locomotives: 35 1019, 52 8177, 52 8079 and 03 2204 will no longer be taking part in the parade. In addition, there are some changes to the timing and the times when 18 201 will depart to be turned in Leszno and then return are no longer fixed at 15:20 and 17:30. 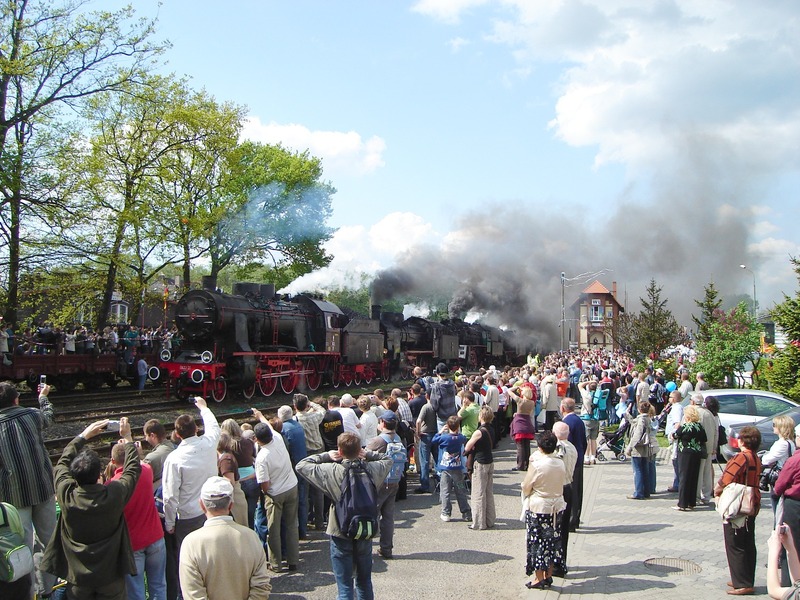 The following steam engines will be taking part in the Gala: Wolsztyn – Pt47-65, Ol49-59, Ol49-69, Tr5-65, Ok1-359, Ok22-31; Chabowka Ty2-911, Ol12-7, TKt48-191; Przewozy Regionalne, Wroclaw – TKt48-18; Great Britain – 5521; Hungary – 220.194; Czech Republic – 423 041; Slowak Republic – 486.007; Germany – 18 201. Please note. The steam-hauled vintage trains on Saturday are likely to be sold out and it may be difficult to buy tickets on the day in the trains. We would recommend buying tickets (15 zl) on the Friday afternoon or evening in the Information Centre in Wolsztyn MPD. Chemnitz Hbf – Cottbus – Wolsztyn. Wolsztyn – Cottbus – Chemnitz Hbf. The BBC has been receiving some stick from some of its UK listeners and viewers for hiring a train to cover the election in India. The following comment is typical of some of the criticism received. Would Mr Biswas or one of his colleagues care to justify the cost of hiring and repainting a train to bring us coverage of a far away election? Given the terrible economic difficulties we’re facing, wouldn’t it be cheaper and just as informative simply to tell us who’s won when the election when it’s over? Such comments are wide of the mark. Peter Horrocks, the BBC’s Director of the BBC World Service, robustly defends the election train. Using a train allows us to journey through this vast country, reaching remote locations. The journey allows us to assess issues like the economy, regional differences, religion and caste identity etc. Our teams are not remote from the story. At each stop, they will be reporting from the location, mixing with people and reporting their views to the world. They won’t just be doing this for English-speaking audiences. They will also be reporting in 13 languages, including Hindi, Somali, Urdu, Tamil, Burmese, Vietnamese and Arabic. So why use a train and why paint it with the BBC logo? Trains are an iconic form of transport in India. This train will carry our broadcasting facilities and act as a mobile studio. It’s a practical way to allow the BBC team to cover the vast distances and to get a little bit of sleep between their hard work in each location. Lastly, I should address the cost of the train. The UK licence fee is only making a minority contribution to the cost of the project. The overwhelming majority of the other funding comes from the BBC’s commercial global news revenues and from the World Service. Bringing the various sources of BBC funding together like this gives great value for money. I think few international news organisations would have the scope to attempt to bring this intriguing election to life in this way. Our audiences around the world should find something of fascination from this imaginative exercise. BTWT applauds the BBC’s initiative. Standard gauge / narrow gauge interchange. But where? Our third competition has proved a real puzzler and Dyspozytor is having a good chuckle because he is in the lead by one point! Rik Degruyter, who travels on Poland’s railways as much as possible in the cab of a steam engine, has correctly identified the location of mystery picture 1, but alas he could not supply any details about the engine. This earns Rik one point. Mystery picture 2 stumped everybody. No right answers for the location and no right answers for the railway, so Dyspozytor gains 2 whole points. Michael Dembinski correctly identified the general geographical area for mystery picture 3, but he could not identify the specific tram line, thus also only gaining 1 point. All the mystery pictures so far were in Poland and now it’s time to move to the UK. Dyspozytor has dug deep into his archives for today’s mystery picture which was taken in the mid 1960s. Clearly it is an interchange siding between a standard gauge railway and an industrial narrow gauge railway. But where? Comment moderation has been turned on to catch those of you who persist in posting your answers via the comments facility. However, in order to keep track of all answers, we really would prefer all answers to be sent via e-mail to: railfan [at] go2 [dot] pl . The Grodziska Kolej Drezynowa (Grodzisk Platelayers’ Trolley Railway) is the result of a remarkable cooperative effort involving a group of local railway enthusiasts, a number of local authorities and Polish State Railways. Originally the enthusiasts wanted to save the Grodzisk Wielkopolski to Opalnica line, one of the oldest railways in the province of Wielkopolska, but sadly their efforts were unable to prevent the track being lifted. They then shifted their attention to the Koscian – Grodzisk line where they were successful in winning the support of the local authorities through whose territory the line runs. PKP donated some elderly hand propelled platelayers’ trolleys and volunteers started clearing the overgrown track. The last train had run on the line in 1995 so there was much work to do. Now the entire 30km route has been cleared. The line is not just a private playground for a group of railway enthusiasts, but is being strongly promoted as a tourist attraction. A range of hand-propelled and motorised platelayers’ trolleys are available for hire. The largest of these, Pikna Ela, a vintage trolley which is propelled by 4 people can take 10 ‘passengers’ in total. Prices are very reasonable and depend on the distance being travelled. A 5 km trip from Grodzisk to Ujazd Wielkopolski costs 19 zloty, about £4-00; while a 30 km trip to Koscian costs 60 zloty, about £12. Contact details for the Grodzisk Platelayers’ Trolley Railway are available here. American bombing followed by the depraved policies of the Khmer Rouge destroyed Cambodia’s infrastructure and killed many of its people. The ravages of war left the roads mined and railway locomotives destroyed. The Cambodians are nothing if not resourceful and thanks to the ‘Norry’ – a do-it-yourself platelayers’ trolley built from tank parts and bamboo – its metre gauge railways have made a most remarkable, and completely unofficial, comeback. Perhaps a similar vehicle – built to carry tourists rather than agricultural goods – could help to save Poland’s disused narrow gauge railways? It may not be the most imaginative viral marketing campaign ever, but it seems that for the first time PKP is recognising the power of the Internet. It certainly is a step in the right direction. Dyspozytor filled in the name of fellow blogger Michael Dembinski who had just posted an article on W-wa Jeziorki about being stuck in several contra flow traffic jams on the Warsaw – Torun road. In the end a 220 km trip took him 4 hours. Mike, why did you not go by train? You could have done the whole journey in 3 hours and 20 minutes, and read the papers or worked on your laptop. After much huffing and puffing PKP Cargo have decided to go ahead with the Steam Gala at Wolsztyn. Here is the programme for this years’ event. As is usual with such enterprises the exact details may differ slightly on the day. The main parade will take place on Saturday 2 May. The now traditional son et lumière – “Light, Sound and Steam” will commence at 21:30 on the evening of Friday 1 May. arr. 52 8177 + 52 8079 + 13 coaches. Berlin – Wolsztyn. The Home railways rank among the world’s largest dock-owners. Ports like Southampton, Harwich, Hull and Cardiff, are all railway-owned and operated, and at most of the railway-owned shipping centres increasing business has recently been recorded. Because of the enormous development of Continental business at the Port of Harwich, the London and North Eastern Railway have just opened a new quay-side passenger station at this point, together with extensive new freight-handling facilities. The new passenger station is 920 feet long, and is equipped with booking offices, money exchange, parcels and inquiry offices, and a spacious refreshment room. For freight handling there is a huge new transit shed, 900 feet long and 63 feet wide, as well as a new quay 6,000 square yards in extent carrying three lines of railway track. Regular sailings between Harwich and the Continent date back to 1863. At the present time, the L.&N.E.R. operate to and from Harwich nightly steamship services with Hook of Holland and Antwerp. The Zeeland S.S. Company operates a daily service to and from Flushing, Holland; and there is also a nightly service with Esjberg, Denmark, conducted by the United S.S. Company. It’s difficult for anyone who has only known the post-privatisation British railway scene to imagine the degree of vertical integration achieved by Britain’s railways at their peak. The ‘Big Four’ owned not only the railway stations, railway track, rolling stock, engines, and railway station, but also designed and built their own trains and employed their own direct labour force to maintain everything in tip top condition. Railway owned road vehicles based at railway owned warehouses collected and delivered goods traffic and for good measure the railways owned most of Britain’s ports and sea ferry services as well. Today’s disconnected railway is not only the most expensive in the world, but also offers apalling customer service. On Monday, former British Ambassador, Craig Murray set out from Ealing at around 12:45 with pre-booked (and supposedly cheaper) return rail tickets to York. We were due to get the 14.30. However the Central Line was entirely suspended, the District Line had “severe delays” and the Piccadilly Line train we eventually got sat still for a quarter of an hour in Hammersmith before proceeding at a snail’s pace between long rests. In short, a journey that normally takes about 45 minutes between our home and Kings Cross took 1 hour and 45 minutes, and we just missed our train. National Express then told me that our tickets had no validity on another train; they could not even be upgraded. I had to buy new ones at on the day prices, which cost me over three hundred pounds. Now their train is getting later and later. I am only escorting somebody and coming straight back. I shall now miss my reserved train back and have to buy another on the day ticket. You would have thought that Poland could benefit from Britain’s mistakes. Not a bit off it – they are taking the British model of the ‘disintegrated railway’ even further! The main entrance to Windsor and Eton Central. There are two railway stations in Windsor: Windsor and Eton Central, from which shuttle trains currently run to Slough on the Great Western Railway main line; and Windsor and Eton Riverside, which enjoys direct trains along the London and South Western Railway’s line via Staines and Twickenham to Waterloo Station in London. These days, the once-magnificent GWR station is little more than a short truncated siding at the back of a Victorian-themed shopping centre, although the LSWR station is virtually complete. If only the relevant authorities had shown a little more imagination, the demise of the GWR station need not have been the case. A bold proposal from Madame Tussuad’s would have seen steam operated vintage trains run from Slough to Winsdor Central where a magnificent ‘Royalty and Railways’ exhibition celebrating Queen Victoria’s diamond jubilee would still be thrilling local residents and tourists alike. But we are running ahead of ourselves! In the mid 19th century, the GWR and the Windsor, Staines and South Western Railway – the latter working in cooperation with the London and South Western Railway – were engaged in a race to provide railway services to Queen Victoria and Windsor Castle. Both companies struggled with opposition from Eton College and the S&SWR – whose proposed route cut across Windsor Home Park – also faced opposition from Castle officials. Gradually the GWR crept closer to Windsor, building increasingly grand stations for the monarch’s convenience first at Langley, then at Slough and finally – in October 1848, via a short branch line from Slough – in Windsor itself. The competing station on the Staines route opened under the auspices of the London & South Western Railway in December 1849. The original GWR platforms would seem – from the layout of the railway arches across the Goswell Road – to have been on South part of the current station site. In 1877, to celebrate Queen Victoria’s Golden Jubilee, the GWR built a much grander station with four platforms, a grand royal waiting room and covered awning under which the royal guards could shelter from the weather. In November 1968, platforms 3 and 4 were taken out of use, and a year later platform 2 was also decommissioned. The station buildings became run down and British Railways hoped to demolish the station and to use most of the area for a modern shopping centre. Fortunately, these plans met strong opposition from local conservationists and came to naught. in the 1980s Madame Tussauds produced a counter proposal – to restore the station, and to create an exhibition called Royalty and Railways which would be served by steam-hauled vintage trains from Slough. Sadly the steam train idea was still born, but the exhibition – soon renamed Royalty and Empire – became a popular tourist destination. The former GWR station was carefully restored complete with a ‘royal train’ – a full-size replica of the steam engine that hauled Queen Victoria’s diamond jubilee train plus two areal Victorian royal train coach bodies, mounted on modern frames and bogies. Regrettably, the exhibition closed in the late 1990s and the once authentically restored station was infilled with pseudo-Victorian boutiques and cafes. To make room for this desecration much of the operational track was covered over – in two separate moves – and prospective passengers now face a long walk from the High Street. And the L&SWR station? The former booking hall has become a cafe and rock music venue. But the rest of the station: tracks, platforms and original wooden all over roof still remains intact and in use as a working example of Britain’s railway history. Detroit City Council voted on April 7, 2009 to demolish Michigan Central Station, passing a resolution calling for ‘expedited demolition’. The building has been on the USA National Register of Historic Places since 1975. Opened in 1913, the building is of the Beaux-Arts Classical style of architecture, designed by the Warren & Wetmore and Reed and Stem who also designed New York City’s Grand Central Terminal. The cost was $15 million. The main waiting room on the main floor was modelled after an ancient Roman bathhouse with walls of marble. The building also housed a large hall adorned with Doric columns and contained the ticket office and arcade of shops. Beyond the arcade was the concourse, which had brick walls and a large copper skylight. From here, passengers walked down a ramp to the 11 platforms. There is a wonderful photo essay about Michigan Central Station on onlyndetroit.com which is well worth exploring. It was the fall of 1973, just six years after the fifteen-floor office tower and the main “grand” lobby of the Michigan Central Depot closed. Photographer and student Keith Jolly was permitted to document, in intimate detail, what may be the saddest chapter in Detroit’s history of neglecting historic architecture. Through the lens of this photographic artist, one can appreciate the remarkable feelings of grandeur and luxury the Michigan Central Station conveyed to arriving and departing passengers. Also captured in these prints the eerie sense of impending neglect and subsequent ruin that would become the Depot’s lasting image. There is a comprehensive history of the building on Wikipedia. Obama’s ‘stimulus package’ was supposed to put new life into the USA’s railroads, but it seems that the Mayor has different ideas. Vauxhall Cross bus station is glorious! It combines a bold modern design with carefully thought out functionality providing easy interchange between rail, underground and bus services. Its designers, Arup Associates, display their pride in their achievement on the company’s own website. The canopy is a landmark and an urban sculpture. By night it becomes an animated floodlit beacon. It is a place of function designed as an object of attraction and a symbol of urban regeneration. Jonathan Glancey, the Guardian’s architectural correspondent, waxes lyrical about the building. The latest building by Arup Associates isn’t – though it might be tempting to think it – some wilfully extravagant public artwork, or a fashionable “iconic” building with a vague, ironic purpose and a funny roof. It is a bus station, nothing more, nothing less, and its opening in Vauxhall Cross, south London, happened without fanfare. And yet, architecturally, it is a trumpet blast: an extraordinary structure that is striking, clear and unmissable. …part of what makes Arup’s work so special is the fact that it is localised. This bus station – and the Underground and mainline stations it also serves – has long been trapped in a sulphorous tangle of roads, themselves overshadowed by such poisonous postmodern structures as the MI6 building and a development of showy flats with madcap roofs that resemble the rear ends of Chevrolet Impalas. To stand out in this jungle, the Arup building needed to have a strong, clear voice – and it does. A building such as this surely deserves an international audience? It should appear in all London tourist guides. It should be on the route of every London coach tour. It should be the subject of tens of thousands of photographs. Well, no, not according to the Metropolitan Police. Five days after the Guardian published Jonathan’s review, it printed the following letter from a 69 year old retired TV cameraman who was visiting London with his 15 year old son. During a recent visit to London I had a nasty incident, which killed interest in any further trips to this city. As I was taking pictures of double-decker buses with my son, we were approached by two policemen. First, we were told that it is forbidden to take pictures of anything in conjunction with transport. Then our names, passport numbers and London hotel address were noted. After that we were forced to delete all pictures that included any transport – even pictures of the new underground station in Vauxhall, which is a modern sculpture! These deletions were not only enforced destruction of private property, but an infringement of our privacy. I understand the need for some sensitivity in an era of terrorism, but isn’t it naive to think terrorism can be prevented by terrorising tourists? Mr Matzka’s letter needs no further comment from us. That serious damage that is being done to the UK’s tourist industry can be seen from how fast his story is being picked up overseas. This article appeared on a Polish website on Friday. As well as Mr Matzaks’s story it describes how Austin Mitchell, MP was challended after taking a photograph of a narrow boat in a lock! All clear at Westminster Station Jubilee Line, but can Tube Lines, deliver the line’s resignalling project on time and on budget? In an exclusive interview with Christian Wolmar published in today’s Evening Standard, outgoing London Underground Managing Director, Tim O’Toole, slams the Treasury and Price Waterhouse Coopers designed of the Public Private Partnership scheme to manage maintenance on the Underground. Wolmar praises O’Toole for maintaining good communications with his staff. He was helped by having an unusual induction. O’Toole is hugely popular among London Underground staff: you only have to travel on the Tube with him to see that the staff both recognise and respect him, as they all greet him. He was fortunate that due to the delay in handing over the Underground to Transport for London, he spent his first five months in London touring the system meeting staff and passengers. PKP bosses in Poland have yet to learn that they should be talking and listening to their staff and passengers. Perhaps they should talk to O’Toole? Lord Adonis travels by train! The ‘Kentish Times’ published an article last December when Lord Adonis launched the year long acceptance testing process for the Hitachi built Class 395 trains that will be running local services on the HS1 line between London and Kent. Click picture to read the whole article. As I travel around Poland by train, one of the commonest gripes that I hear from the train crews is that no-one listens to them – there is no effective feedback channel up which information from the people responsible for service delivery can reach PKP Directors and senior managers. I reply, only half jokingly, that if only PKP directors and government ministers had to queue up to buy their own tickets and travelled around Poland by train – instead of rushing about by plane and chauffeur driven limousine – the quality of service experienced by rail passengers would improve overnight. In Britain, we may be witnessing the death throes of a government on its last legs, but we do have a transport minister who cares about railways! Lord Adonis is travelling the 2,000 miles of Britain’s rail network that he knows least, just to see what’s going on. He is writing about his experiences in The Times. On Tuesday, he wrote about his journey on the Night Riviera sleeper train to Cornwall. (How many people are aware that there is a sleeper train to Cornwall? It must be one of First Great Western’s best kept secrets!) He also discovers that the one coach trains on the Par – Newquay line can be overwhelmed with passengers during bank holidays. The line to Newquay is not quite the classic case of the branch line fallen on hard times but it is reviving. It kept its holiday express trains to London post-Beeching and also a good deal of china clay freight traffic. Now it has seven weekday local trains winding slowly along the 21-mile line in addition to the Saturday long-distance trains. The local trains are mostly single-carriage trains like the one I take. Ours is pretty full there and back, including a party of young surfers out for a day from Saltash who quickly take up all the luggage racks with their surfboards. Apparently on Good Friday the train was so full with surfers that a local coach had to be found to take half of them. With Newquay a growing attraction, the future for the line appears bright, although it is now running at full capacity. On Wednesday, he writes about his visit to the Swanage Railway. The large, enthusiastic and highly professional team at the Swanage operate steam and old diesel trains along a dozen miles of track from Norden, with a full daily timetable. They want to link up to the London-Weymouth main line at Wareham. There is strong local support and, since the track is all there and the business case is promising, the proposal is highly credible. Britain’s preserved steam railways are a remarkable part of the railway system and the national tourist industry. As a proponent of new high-speed rail lines, I am keen to build a new technological future for the railways, breaking with our baleful historic tradition of patch-and-mend. The challenge is to celebrate the best of the past – as do our preserved railways – while boldly seizing the latest technology to create anew for the future. The track on the Swanage Railway may now be “all there” but it was ripped up in indecent haste by British Railways in an attempt to crush the nascent Swanage Railway Project and was only put back thanks to the heroic work of volunteers and the local residents who dug deeply into their own pockets. Yet, in spite of the best efforts of the Swanage Railway Trust, local residents – after 37 years of waiting – are still without the daily link to the main line network that they have worked so far to achieve. Meanwhile the A351, the main road down the spine of the Isle of Purbeck, has had millions of pounds invested in ‘improvements’ which only serve to funnel more day trippers in their motor cars into the congested streets of Swanage and Corfe Castle. Were Lord Adonis to intervene to assist the Swanage Railway achieve a permanent link up with the main line what a real difference that could make? As well as a daily commuter service for local residents, how about regular summer weekend steam specials from Bournemouth to Swanage and Corfe Castle to bring day trippers without their cars? The Times – A journey to the past – and the future? River Blyth swing bridge. Southwold Museum archives. The Southwold Museum has put on-line an impressive amount of material about Southwold’s past. An article by David Lee, ‘Transport to Southwold’, includes a description of the town’s road, rail and water links. There is a short history of the Southwold Railway including a gallery of photographs. The picture shows one of the railway’s original diminutive Sharp Stewart 2-4-0T engines hauling a mixed train. Note the line’s unusual 6 wheeled carriages. Click on the photograph to proceed to the Museum’s Southwold Railway section. On April 11th 1929 the Southwold Railway closed. The Southwold Railway was one of England’s more curious public narrow gauge lines. 9 miles long, it was built to connect the small Suffolk seaside town of Southwold to the GER mainline at Halesworth. It was opened in 1879 and laid to a gauge of 3ft, which was common on public and industrial lines in Ireland and the Isle of Man, but only used on a handful industrial lines on the British mainland. As in the case of the Welsh Highland Railway, the line’s legal identity continued long after closure and the railway formation remained intact. An abindonment order was only obtained in the 1990s releasing land for development at Halesworth. The Southwold Railway Society was formed in 1994 with the long-term objective of restoring the line. The Society was reconstituted as the Southwold Railway Trust some time later. In 2007, the Trust applied for planning permission to relay the line, but unfortunately due to a small minority of local activists who opposed the reopening proposal, the application was rejected. Competition No. 3 is going very well! Gavin Whitelaw has donated a bottle of festive spirits. So far the results are as follows. Rik Degruyter identified the location of picture No. 1 correctly, but provided no more information about the locomotive. This gains him 1 point. Nobody so far has correctly identified the subject or location of picture No. 2. If this holds Dyspozytor gains 2 points. Today’s picture is a frame from a video taken by Neohagrid. Points will be awarded for identifying the tram line and the tram. Please send your entries to BTWT by e-mail and not as comments. Narrow gauge pioneer, 2-4-2T built by W. Gunther in 1855. The region of Upper Silesia (under German control until the First World War) has a long industrial history, with mining for minerals and coal, iron and steelmaking and associated industries being long-established. Railways were built to serve the area in the 1840s, but they did not do much to assist the basic needs of the industries – transporting raw materials between the mines and foundries. In 1845, Gebruder Oppenfeld in Wroclaw put forward a proposal for a local railway to serve the industrial needs. The engineer was Rosenbaum, who was also engineer for the Oberschlesische Eisenbahn Aktien Gesellschaft, which had built the standard gauge railway linking Wroclaw with Upper Silesia. The project brought forth protests from those who carried the freight by road, while there were also problems with funding the project. In 1846 the gauge of the proposed railway was set at 30 ‘inches’ – being approximately equivalent to the 2ft 6in gauge lines that were built in areas of British influence or the much later 760mm gauge of the Austrian empire and the 750mm gauge which was popular in Germany in later years and the ‘norm’ for narrow gauge railways in Russia. However, the formation of the German state, let alone standard units of measurement, was still some years in the future and the Prussian equivalent of the inch was the ‘zoll’, being 26.154mm. 30 zoll therefore created a gauge of 785mm. The OEAG, no doubt being concerned at the intrusion of another railway into its area of influence, also applied for construction of a narrow gauge railway, but on the condition of significant financial contribution from the state. Oppenfeld announced the intention to commence construction at their own cost and this seems to have forced the OEAG’s hand – whatever the case, Oppenfeld seems to have withdrawn and OEAG proceeded with construction without state assistance; the company was granted a concession for construction and operation of a narrow gauge railway on 24 March 1851, although it seems likely that construction had commenced the previous year. In 1852 it seems that a curious proposal emerged, whereby a double track, horse worked railway was to be built, with the ‘inside’ rails of each line being spaced and constructed such that they could be used as a single line with mechanical haulage. Not surprisingly, this proposal (if it was ever seriously contemplated) was soon dropped and the first sections of line may have been opened for traffic in 1853. The first section of the ‘main’ line opened in 1854 from Tarnowskie Gory through Bytom Karb to Bytkow, about 21km, together with a number of branches and sidings to serve individual factories etc. Remarkably, a significant portion of this line is still in operation today, between Bytom and Tarnowskie Gory, although the only traffic now is seasonal, providing a link between the city of Bytom and the recreational area near Miasteczko Slaskie, north of Tarnowskie Gory – Upper Silesian industry has declined steeply in the last 20 years and the urban areas are now severely depressed. Theft of rails, fixings, rolling stock and other equipment for sale to scrap merchants has become a severe problem for the railway, but it soldiers on, albeit with diesel traction today, still on a gauge of 785mm. By 1860 a number of extensions, branches and sidings had been opened and the main network extended to over 60km of route. Initially trains were hauled by horses, but traffic was growing quickly and the gradients of up to 1:40 and curves as tight as 40m radius proved problematical. In 1855 two steam locomotives were introduced and by the end of the following year there were ten locomotives in use, although there were still 150 horses employed on sidings. By 1858 there were 1830 wagons and the railway carried 580,840 tons of freight. By comparison, in 1873 the Festiniog Railway (widely regarded as the most significant British narrow gauge railway) carried 144,091 tons of slate. The locomotives were built by W. Gunther of Wiener Neustadt; the same firm had already built, a year earlier, two similar locomotives for a 900mm gauge railway leading from Wiener Neustadt to Fischau. The OEAG requirement was for a locomotive to haul 100t gross on a gradient of 1:60 at a speed of 11.25kph. They were 2-4-2T locomotives, with the dimensions varying somewhat between the initial two and the later eight. A drawing can be found at the head of this article. It is difficult now to establish how well these very early narrow gauge locomotives (built almost a decade before the introduction of steam haulage on the Festiniog, the first narrow gauge locomotives in Britain) performed – the fact that two were delivered in 1955 with another eight the following year suggests the OEAG must have been relatively satisfied with the initial results. However, developments in operation of the railway led to them having a short operational life, at least in Upper Silesia. In 1856 the horse traffic on the lines was leased out to Rudolf Pringsheim, a banker from Gliwice, and on 1 January 1857 the OEAG railways were taken over by the state. Pringsheim aspired to take over all traffic and it is difficult to know now, to what extent problems with the locomotives may have affected the state railway’s actions. However, from 1 October 1860 Pringsheim took over all operation of the narrow gauge railway, under a 12 year lease; the state was responsible for maintenance of the track and installations, while Pringsheim paid a toll based on the ton-miles of freight carried. Pringsheim soon disposed of the steam locomotives and reverted to 100% horse haulage. By 1870 traffic had increased to over a million tons per annum and when his lease was renewed in 1872, for another 12 years, he had to make the investment of introducing steam locomotives again. By this time technology had advanced and the 0-4-0T locomotives produced by Krauss and Hagans in that year were relatively straightforward designs. Subsequently, the Upper Silesian narrow gauge saw locomotives develop through 0-6-0Ts, 0-8-0Ts, various forms of articulation of 0-10-0Ts and the ultimately quite numerous 0-10-0T form and, from the 1960s Romanian-built 450hp Lxd2 diesel hydraulic locomotives which served until the end of freight traffic in 2001 and still haul the ‘tourist’ trains today. The narrow gauge system also developed in extent, reaching a total of over 230km of lines, plus of course many more kilometres of sidings. In 1955, probably the peak year of operation, the system carried over 6 million tons of freight and, on the Gliwice – Markowice line almost 1.8M passengers were carried. But what of those original locomotives? All are believed to have been sold in 1862-3. Subsequent histories are not documented, other than it being known that one locomotive survived on the Faxe Kalbruk railway in Denmark until about 1920 – Denmark appears to have had a number of 785mm gauge railways. The question therefore arises – just how successful were these original locomotives? Surely there can’t have been any immediately apparent defects, if the first pair in 1855 were followed by another eight? Yet the state railway seems to have tired of operating the narrow gauge line and handed over the operation to Pringsheim, who disposed of all the locomotives within about seven years of them having been built. Yet again, if the locomotives had been that problematical, why did one of them survive for another 60 years in Denmark? The evidence suggests that they had the potential to be useful machines but perhaps were not capable of dealing with the growth of traffic being experienced on the Upper Silesian system at that time and possibly the state railway wanted to divest itself of a comparitively minor operation and Pringsheim didn’t have the capability to deal with them. How do you take only one cow to market? The Listowel and Ballybunion Railway was a steam-powered Lartigue monorail that linked Listowel and Ballybunion, in County Kerry in Ireland. It was 9 miles (14.4 km) long and opened on 1 March 1888. The locomotives were of 0-3-0s with tenders equipped with boosters for use when climbing steep gradients. They were built by the Hunslet Engine Company and had two boilers in order to balance, one of which had to be stoked by the driver. The tender wheels were driven by a two cylinder booster engine via spur gears. A smaller vertical-boilered engine nicknamed the “coffee pot” was said to have been used during the railway’s construction. One challenge with the Lartigue system was that it was not possible to build conventional level crossings. Where roads crossed the track, an attendant-operated device to lift the track, resembling a double drawbridge was provided. Where a farm track crossed the line the railway track could be slewed out the way by means of turntables. These were locked and the farmer provided with a key. Once unlocked the track could be swivelled to one side to allow vehicles to cross. Both the swivelling and drawbridge type crossings were automatically linked to signals which stopped any approaching trains. Curved turntables also served the same function as points on an ordinary railway. See photograph above. Passengers could not pass from one side of a carriage to another while in motion. A pair of steps was built into one end of some of the passenger coaches, while at least one pair was carried on a separate wagon. This allowed passengers to cross from one side of the line to the other while the train was stopped at a station. Heavy loads had to be evenly balanced. If a farmer wanted to send a cow to market, he would have to send two calves to balance it, which would travel back on opposite sides of the same freight wagon, thereby balancing each other. The line was closed in 1924 after the track was damaged during the Irish Civil War. In 2003 the Lartigue Monorailway Restoration Committee, a voluntary organisation based in Listowel, opened a 1km length of Lartigue monorail on the trackbed of the former North Kerry line in Listowel. The line is worked by a diesel locomotive built to resemble the original steam engines. One of our friends has sent us link to the www.wyburzone.pl website – a web catalogue of demolished Polish architecture. There are manor houses and palaces, factories and power stations, tram depots and railway stations. Well worth exploring!